Hello, my crafty friends. 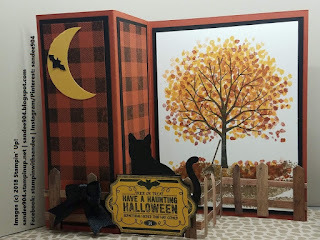 Welcome to the September Paper Crafting Blog Hop! I am participating in this blog hop with fellow Stampin' Up! demonstrators from all over the United States, Canada and United Kingdom! You might be starting the blog hop right now, or you may be coming from Anastasia Radloff's blog. Welcome one and all. The theme for our blog hop this month is halloween! I decided to really s-t-r-e-t-c-h my imagination and challenged myself to use a stamp set without a halloween theme. I know you will not believe it, but my cat punch is making another appearance. 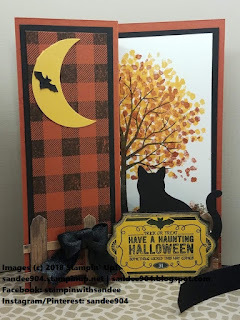 (Click here to see my card from the June Blog Hop or the August Blog Hop.) The cat punch has been a great investment. It is so versatile. The Sheltering Tree stamp set is one of my favorite stamp sets from the Annual Catalog. I don't use it often enough. The fence is pieced together with scraps from the Wood Textures 6x6 Designer Series Paper. The sentiment stamp is from the Labels to Love stamp set that was introduced in the Holiday Catalog last year (yes, the bat flying around the moon is fussy cut from the label!). And don't you LOVE the luscious Black satin ribbon (Annual Catalog) and the new Buffalo Check background stamp from the Holiday Catalog!! I hope you have enjoyed my card today. Leave a comment below with a trail to find you so I can see your creations. Thank you for stopping by my blog today! Make sure you keep hopping along to see all the other great projects. Click on the "Next" button below to visit Melanie Coverston's blog. September Hostess Code is CFZ4JESQ. Please use this code unless your order already qualifies for Stampin' Rewards ($150 USD). 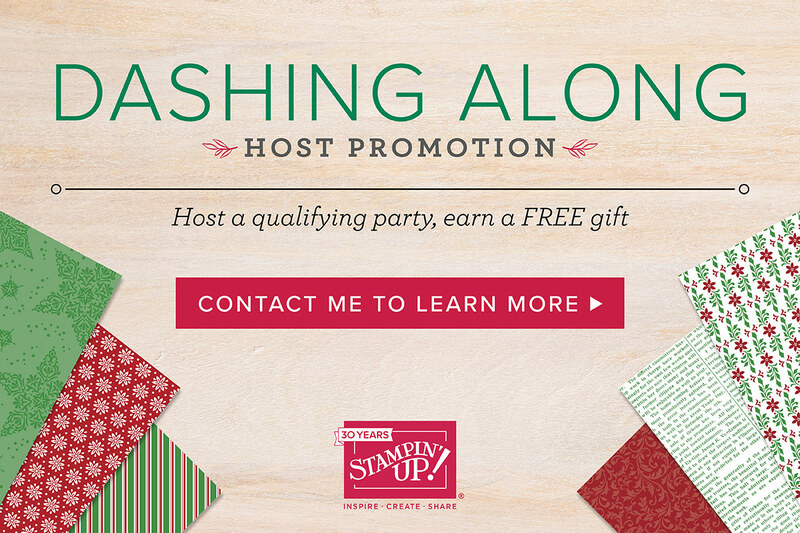 Also, this month only, host a qualifying party and receive the Dashing Along Designer Series Paper free. Message me if you have questions. 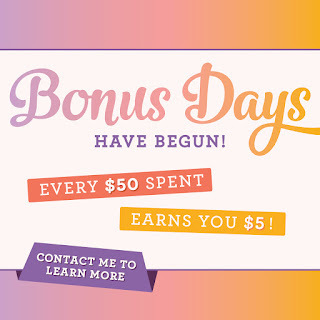 Customer Appreciation: Do not forget to use your Bonus Day Coupons earned on your purchases from last month of August. If you have any difficulty, send me a message. As always, it would be my pleasure to be your demonstrator if you do not already have one. I would love to share a copy of the new 2018-19 Annual Catalog with you. Message me if you need information on how to receive a copy of the 2018-19 Annual Catalog, the new 2018 Holiday Catalog, have any questions or need any assistance whatsoever. Hello, my crafty friends. 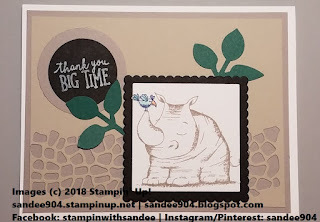 Hope you enjoyed the August blog hop with fellow Stampin' Up! demonstrators from all over the United States, United Kingdom and Canada! I had loads of fun creating my pet themed card using Animal Outing Stamp Set. 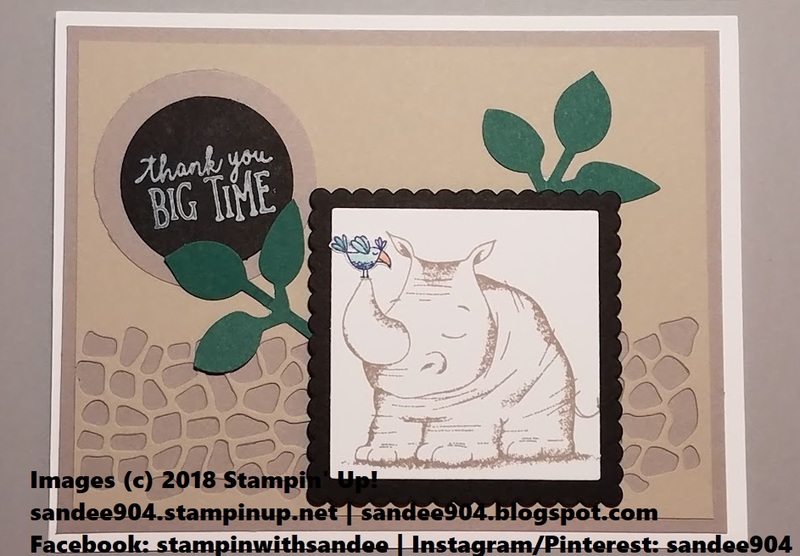 I have been slacking in posting my projects the last two weeks, but this week I thought I would share a quick card using the rhino from the Animal Outing Stamp Set and the stone image from the Animal Friends Thinlits Dies. This bundle is featured in the Animal Expedition Suite found on p. 27 of the 2018-2019 Annual Catalog. This card was super easy and will be super easy to recreate. You will see that I used the leaf punch which carried over from last year's Holiday Catalog that was paired with the Painted Harvest stamp set found on p. 139 of the 2018-19 annual catalog. I could have done the peek-a-boo method like my Blog Hop card, however, I decided instead to use the Layering Squares Framelits Dies. If you need any measurements or additional information for recreating this card, please feel free to message me. Thank you for stopping by my blog today! Leave a comment below with a trail to find you so I can see your creations. Holiday Catalog is live today - September 5, 2018!! Dashing Along Host Promo: Host a Holiday catalog event during September 1 through September 30 and earn the fun (and FREE) exclusive Dashing Along Designer Series Paper with a minimum $250 USD in sales. 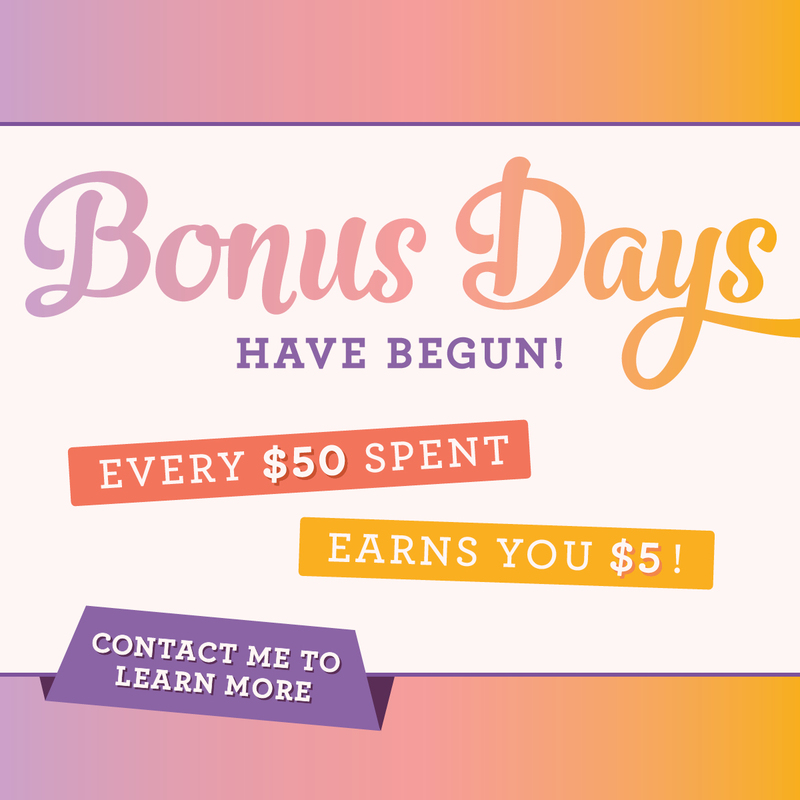 Customer Appreciation: Be sure to redeem your Bonus Day Coupons that you earned on purchases in August on your order this month. Message me if you have any questions. September Hostess Code is CFZ4JESQ. 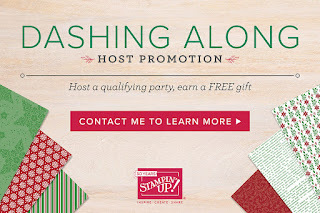 Please use this code unless your order already qualifies for Stampin' Rewards ($150 USD). Message me if you have questions. I will be closing the order on Friday, September 28. September Paper Pumpkin kit has a "spooky" theme (and PURPLE!!) Be sure to subscribe by September 10th. I look look forward to seeing your creations! 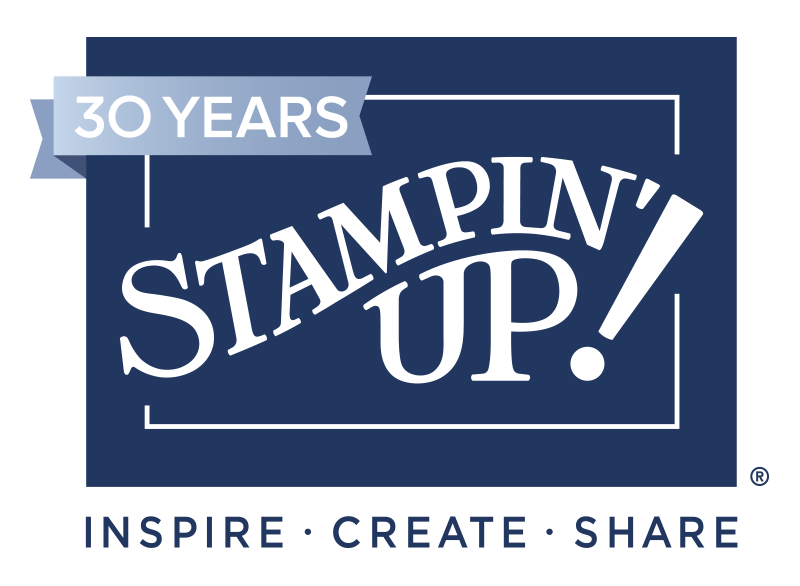 In October 2018, Stampin’ Up! will turn 30! The convention will be held at the Orange County Convention Center in Orlando this November. Do you know how you can go? Join my team so that you are eligible to attend. As always, it would be my pleasure to be your demonstrator if you do not already have one. I would love to share a copy of the new 2018-19 Annual Catalog with you. Message me if you need information on how to receive a copy of the new 2018-19 Annual Catalog, have any questions, or need any assistance.